In today’s hectic world it has become quite evident for people to lose their mental health balance. This loss of balance of mental health is depicted in the form of anxiety and depression. It is a proven fact that yoga helps to stabilize the mental health of human beings. Let us see how yoga can help you enhance your mental health. There are several yogic asanas which cheer your mood and bring you out from anxiety and pressure. Here are some of the most commonly practiced yogic asanas which can substantially contribute towards enhancing your mental health. Setu Bandha Sarvangasana: This asana is also known as the Supported bridge pose, this asana involves a back bend. Lie on a mat with your arms rested beside your body and then slowly raise your back upwards with your feet firm on the floor. Don’t stretch too much. This asana helps to calm down a frenzied mind and also helps to reduce anxiety and adds an instant vigor to your body. Avoid this asana if you are suffering from any neck injury. Salamba Sarvangasana: This asana is also called as Supported Shoulder Stand and involves lying in an upside down position. This asana provides oxygen to the bodies that are deprived of it thereby making you feel more lively and cheerful. To practice this asana lie on your back and then slowly raise your legs in the upward direction, support the hips with the help of your hands but see to it that you don’t raise the head and stretch your legs straight up in the air. Put some blankets underneath your body to feel comfortable. 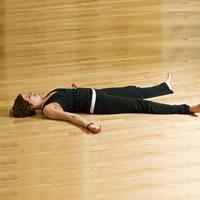 Savasana: It is also referred to as Corpse pose, this yogic asana is the most relaxing and rejuvenating asana. Furthermore, it is also easy to perform. Just lie down on your back and close your eyes and allow your mind to settle down. This asana helps to release your thoughts and emotions that are unprocessed in your mind thereby giving you a feeling of relaxation. The best way to keep yourself away from stress and anxiety is to practice yoga especially early in the morning. However, bear in mind that if you have any severe mental illness, then it is advisable that you perform yoga only under strict supervision to avoid any further complications. very good ,,,, ye aasan main janna chah raha tha …. apne mind ke relecsetion ke liyee..
in aasan ko samjhane ke liye dhanywaad. main apne minde ke liye in aasan ko dhundh raha tha..